Michelle likes to make a homemade breakfast on Sundays and this past weekend was no exception. She had asked me what I felt like having and I had suggested biscuits and sausage gravy. I know it is far from the healthiest breakfast out there, but it tastes really good and it is something we almost never have. I found this recipe from Cook’s Country that was simple and quick to make and didn’t use any ingredients that we didn’t already have in the house, which made it even better to try. For the biscuits: Adjust an oven rack to the middle position and heat the oven to 450 degrees. Line a baking sheet with parchment paper. Pulse the flour, sugar, baking powder, baking soda, salt, butter, and shortening in the food processor until the mixture resembles a coarse meal. Transfer the mixture to a large bowl. Stir in the buttermilk until combined. On a lightly floured surface, knead the dough until it is smooth, about 8 to 10 kneads. Pat the dough into a 9-inch circle, about 3/4-inch thick. Using a 3-inch biscuit cutter dipped in flour, cut out rounds of dough and arrange them on a prepared baking sheet. Gather the remaining dough, pat it into a 3/4-inch-thick circle, and cut out the remaining biscuits. You should have 8 biscuits in total. Bake until the biscuits begin to rise, about 5 minutes, then rotate the pan and reduce the oven temperature to 400 degrees. Bake until the biscuits are golden brown, about 12 to 15 minutes, then transfer the biscuits to a wire rack and let them cool. For the sausage gravy: Combine the flour, fennel, sage, and pepper in a small bowl. Cook the sausage in a large nonstick skillet over medium heat, breaking up the meat with a wooden spoon, until the sausage is no longer pink, about 8 minutes. Sprinkle the flour mixture over the sausage and cook, stirring constantly, until the flour has been absorbed, about 1 minute. Slowly stir in the milk and simmer until the sauce has thickened, about 5 minutes. Season with salt and serve over split biscuits. The biscuits can be stored in a zipper-lock bag for 2 days to be used again later on. It’s a very simple meal that makes a great breakfast. You could just have this alone with your coffee, tea or juice or serve it with an egg over easy or scrambled eggs and you have a really nice breakfast for a weekend. We actually made extra so there was some left over for me to have another day. 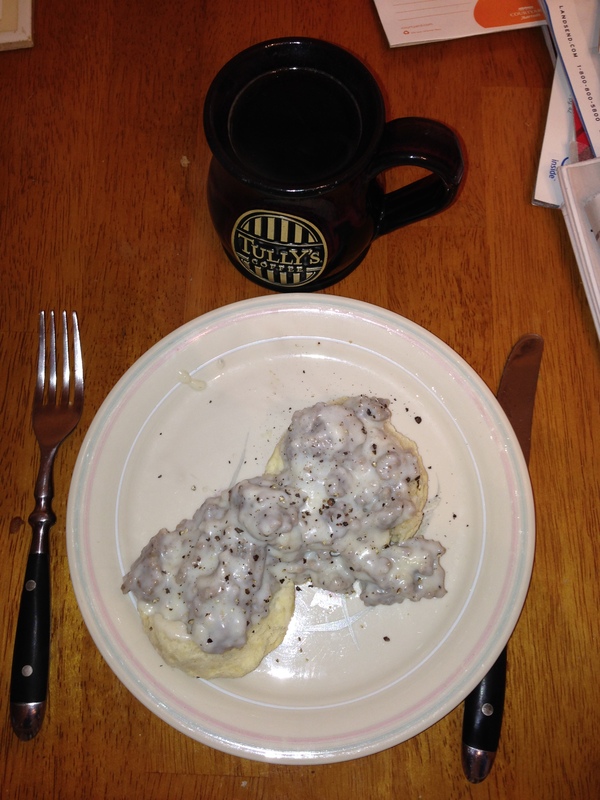 I just heated some of the sausage gravy up and added a little milk to it to loosen it up and had some with a biscuit. It was pretty darn yummy. That’s all I have for today. Check back next time for another recipe. As always, there’s still lots to come, including more Thanksgiving ideas and recipes to use. Until next time, enjoy the rest of your day and enjoy your meal!